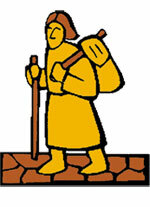 Welcome to the VIA FRANCIGENA wiki! Anyone wanting to contribute to the WIKI must read this first. Please note: this site has been set up as a collaborative information publishing site for pilgrims and travellers along the Via Francigena (using whatever mode of transport they may choose : on foot, on horseback, by bicycle, or in any type of motorized vehicle) - or indeed, anyone at all interested in this ancient pilgrimage route, who desires to contribute information they feel might lead to helping other pilgrims and travellers along their way. It also aims to reflect an energetic and forward-looking vision for the VF, in both its maintenance and development, for all categories of traveller or pilgrim. BUT - please remember - it is also a practice site for any budding wiki editors among the pilgrim community who may never have attempted anything like this in their life before. (Just like walking to Rome.) So please bear with any inadvertent accidents which may happen along the way! 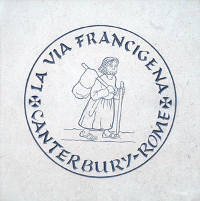 Fundamentally then, this should be seen as a website for Via Francigena pilgrims written by themselves - but if, as a reader coming from outwith the pilgrimage community, you have any relevant information, please feel free to contribute your own article, or create your own page and share the information with us there. An integral feature of this site is the VF Glossary -- an encyclopaedic collection of terms commonly used by the various language communities which make up the population of pilgrims travelling the VF, provided by members of that community themselves. Anyone wanting to edit the WIKI must read this first. NOTE : The basic editing page describes how to create pages for this wiki. You can also practise your editing skills in the wiki sandbox.